NAHA, OKINAWA, Japan — More than 200,000 Okinawans, U.S. servicemembers and their families gathered to watch and participate in the world’s largest tug-of-war, held here Oct. 9-11during the Naha Matsuri, or Naha Festival. The festival also included martial arts performances, music, dancing, food and fireworks. 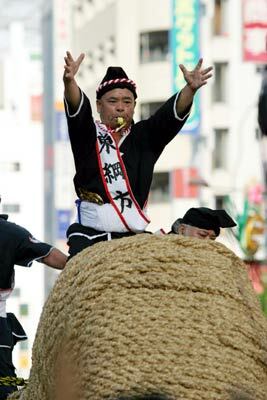 The tug-of-war, or Tsunahiki in Japanese, is the main event of the festival. It is a tradition that has gone on for more than 300 years, only stopping during World War II. In the past, the outcome of the Tsunahiki would help shamans predict the future, but nowadays the competition is simply for fun. 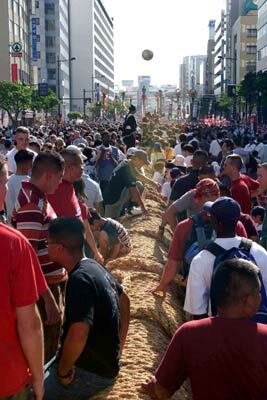 The rope, which is reconstructed annually for the tug-of-war, has been featured in the Guinness Book of World Records since 1997 as the largest rope made from natural materials. The rope is nearly 600 feet long, six feet in diameter and weighs more than 40 tons. Before the event could begin, the ends of the two-piece, giant rope were connected. It took more than 30 minutes to make the massive knot and secure it with a large wooden beam. Tying the rope together signifies the bringing together of east and west Naha. Two men, portraying the past kings of east and west Naha, were brought to the center of the rope on platforms where they demonstrated martial arts before symbolically challenging each other to a battle. A large gold ball above the crowd dropped confetti and balloons on the crowd and the tug-of-war began. Team leaders dressed in traditional battle garments stood on top of the rope and screamed “Hai-ya!” and “O-Shoi!” -- the equivalents to “heave-ho” and “pull harder” -- to their team members, urging them to pull with all of their chikara, or strength. The leaders cheered the 25,000 teammates who tried to make their teams victorious. In the contest, the team who pulls the massive rope more than five meters wins. If a team does not pull the rope more than five meters, the team who can move the rope more than two meters in 30 minutes is declared the winner. If no team can pull the rope two meters in 30 minutes, it is declared a tie. This year, west Naha won when the rope crossed the five-meter mark in a speedy 6 minutes and 26 seconds. 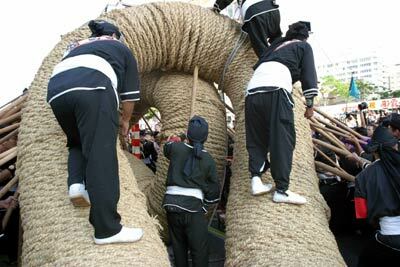 After the tug-of-war, the colossal rope was cut into smaller pieces and passed to crowd members for good luck.